Soluble sugar levels must be closely regulated in germinating seeds to ensure an adequate supply of energy and building materials for the developing seedling. Studies on germinating cereal seeds indicate that production of sugars from starch is inhibited by increasing sugar levels. Although numerous studies have focused on the regulation of starch metabolism, very few studies have addressed the control of storage lipid metabolism by germinating oilseeds. Mobilization of storage lipid by germinating seeds of the model oilseed plant Arabidopsis thaliana (L.) Heynh. occurs at a greatly reduced rate in the presence of exogenous glucose or mannose, but not in the presence of equi-molar 3-O-methylglucose or sorbitol. The sugar-insensitive5-1/abscisic acid-insensitive4-101 (sis5-1/abi4-101) mutant is resistant to glucose inhibition of seed storage lipid mobilization. Wild-type seedlings become insensitive to glucose inhibition of storage lipid breakdown within 3 days of the start of imbibition. Growth in the presence of exogenous glucose significantly retards mobilization of seed storage lipid in germinating seeds from wild-type Arabidopsis. This effect is not solely due to the osmotic potential of the media, as substantially higher concentrations of sorbitol than of glucose are required to exert significant effects on lipid breakdown. The inhibitory effect of glucose on lipid breakdown is limited to a narrow developmental window, suggesting that completion of some critical metabolic transition results in loss of sensitivity to the inhibitory effect of glucose on lipid breakdown. Soluble sugars, such as glucose and sucrose, have been postulated to act as signaling molecules that help regulate a wide variety of plant developmental and physiological processes [1–13]. These processes include flowering [14–17], seed germination [18–20] and photosynthesis [21, 22]. One of the most thoroughly characterized sugar-regulated processes is the breakdown of starch by germinating cereal seeds. Starch metabolism by germinating seeds must be tightly controlled to ensure an adequate supply of sugar to the developing seedling [13, 23]. As alpha-amylases play a critical role in starch metabolism, the regulation of alpha-amylase activity has formed a major focus of studies on starch metabolism. Increasing sugar levels have been shown to repress expression of alpha-amylases in rice seedlings  and suspension culture cells . Studies using barley embryos provide evidence for the existence of independent glucose and disaccharide signaling mechanisms in the regulation of alpha-amylase expression . Sugar regulation of alpha-amylase expression has also been shown to occur at multiple levels. Sugar levels affect not only alpha-amylase transcript levels [24, 25], but also mRNA stability [27, 28] and protein transport and turnover . Sugar-signaling pathways may also interact with other signaling pathways in the control of alpha-amylase activity. For example, sugars repress a gibberellin-dependent pathway for alpha-amylase expression in barley embryos . Little is known about the signal transduction pathways for sugar responses. Proteins postulated to act in control of at least some sugar-regulated processes include hexokinases [31–34] and SNF1-related protein kinases [35, 36]. Hexokinases have been suggested to play a role in sugar repression of alpha-amylase activity. This hypothesis is based on findings that only those glucose analogs that are believed to be substrates for phosphorylation by hexokinases are effective in repressing alpha-amylase expression . However, the role of hexokinases in sugar responses remains under debate [38–40]. Genetic approaches are being used to identify additional components of sugar-response pathways. Arabidopsis mutants that are defective in sugar-regulated expression of the genes encoding patatin , beta-amylase [42, 43], plastocyanin  and the ApL3 subunit of ADP-glucose pyrophosphorylase  have been isolated. Additional sugar-response mutants have been identified by taking advantage of the fact that high concentrations of exogenous sugars (glucose or sucrose) inhibit early seedling development of wild-type Arabidopsis. Several groups of Arabidopsis mutants that are resistant to the inhibitory effects of high sugar concentrations have been isolated [46–50]. Characterization of these mutants reveals that the sis5 , sun6 , gin6  and isi3  mutants are allelic to the abscisic acid insensitive mutant abi4  and the sis4, isi4  and gin1  mutants are allelic to the abscisic acid biosynthesis mutant aba2. In addition, the ethylene constitutive response mutant ctr1-1 , as well as the ethylene-overproduction mutant eto1 , display sugar-resistant phenotypes . Conversely, the sugar-response mutant sis1 exhibits an ethylene constitutive response phenotype and is allelic to ctr1-1 . The prl1 mutant, which exhibits increased sensitivity to exogenous sugars [55, 56], carries a mutation in a gene that encodes a WD protein that interacts with SNF1 protein kinases . Although a large number of studies have been conducted on sugar regulation of starch breakdown by germinating cereal seeds, very little work has focused on determining whether lipid breakdown by germinating oilseeds is also sugar regulated. Findings that the expression of at least two genes involved in lipid metabolism is sugar regulated  and that sucrose can affect total lipid content in germinating seeds  suggest that lipid metabolism may also be sugar regulated. Work presented here indicates that storage lipid breakdown is significantly delayed in germinating Arabidopsis seeds exposed to exogenous glucose. Exposure to exogenous sugars, such as glucose and sucrose, has long been known to retard rates of starch mobilization in germinating cereal seeds [13, 23]. Therefore, it was of interest to determine whether exogenous sugars also affect rates of lipid mobilization in germinating seeds of plants, such as Arabidopsis thaliana, that store their energy reserves in the form of lipids. Seed storage lipid levels were monitored by measuring eicosenoic (20:1) fatty acid levels. Eicosenoic fatty acid represents approximately 17% of seed lipid reserves, but is present in only very low amounts in membrane lipids. For example, in one study 20:1 fatty acid was found to constitute only 0.2% of the fatty acid present in Arabidopsis roots and was below the detection threshold in shoots . Therefore, the rate of decrease in 20:1 fatty acid levels reflects the rate of decrease in seed storage lipid levels. Seeds of wild-type Arabidopsis thaliana var. Columbia were sown on plates containing solid minimal Arabidopsis media , supplemented with glucose and/or sorbitol. Seeds/seedlings were harvested at different time points after the start of imbibition. As shown in Figure 1, seeds sown on media containing 0.11 M glucose metabolize 20:1 fatty acid at a significantly slower rate than seeds sown on media lacking sugar. The effect of 0.11 M glucose on 20:1 mobilization is not solely due to the increased osmotic potential of the media, as equi-molar and even twice equi-molar concentrations of sorbitol have little effect on 20:1 mobilization (Figure 1). Exogenous glucose inhibits mobilization of seed storage lipids. Eicosenoic (20:1) fatty acid levels were measured in wild-type Arabidopsis seeds/seedlings harvested from the indicated media at different times after the start of imbibition. Results presented are means ± SD (n = 3). Glc, glucose; Sorb, sorbitol. This experiment was repeated, with similar results. Mannose is a glucose analog that has been postulated to affect seed germination  and sugar-regulated gene expression [31, 32] via a signaling pathway that requires hexokinase activity. For reasons that remain unclear, mannose inhibits seed germination and early seedling development at concentrations that are 100–200 fold lower than the concentrations of glucose required to exert similar effects [19, 46–48, 50]. As shown in Figure 2, growth on low (1.4 mM) concentrations of mannose also leads to a significant reduction in 20:1 breakdown. 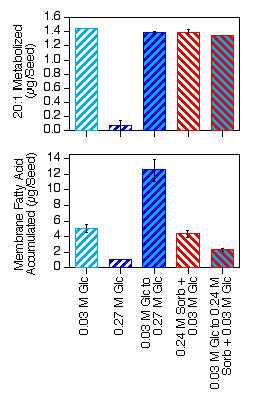 In contrast, 3-O-methylglucose has little effect on 20:1 levels (Figure 2). 3-O-methylglucose is a glucose analog that, in at least some organisms, is transported by hexose transporters [61–64] but is phosphorylated very inefficiently, if at all, by hexokinases . Seedlings grown on media containing 3-O-methylglucose have 20:1 levels that are similar to the 20:1 levels of plants grown on approximately equi-molar concentrations of sorbitol, but that are much lower than the 20:1 levels of plants grown on equi-molar concentrations of glucose (Figure 2). Effects of glucose analogs on seed storage lipid breakdown. Eicosenoic (20:1) fatty acid levels were measured in seeds/seedlings harvested from the indicated media at different times after the start of imbibition. Results presented are means ± SD (n = 3). Glc, glucose; Man, mannose; 3-OMG, 3-O-methylglucose; Sorb, sorbitol. This experiment was repeated, with similar results. Growth on high (0.27 to 0.33 M) concentrations of glucose or sucrose has been shown to severely inhibit development of Arabidopsis seedlings [33, 46–50, 55]. Most seedlings grown on high-sugar media lack true leaves and have cotyledons that have undergone little expansion, even after two to three weeks of growth. As more moderate sugar concentrations slow 20:1 mobilization (Figure 1), it was of interest to determine whether seedlings arrested by growth on high-sugar media are able to mobilize any of their seed storage lipid. 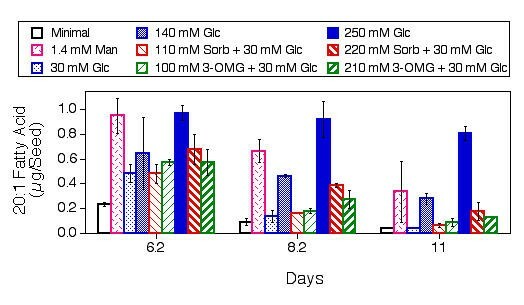 As shown in Figure 3, seedlings arrested by growth on 0.3 M glucose retain approximately 80% of their seed storage lipid, even after 22 days of growth. In contrast, 22-day old seedlings grown in the presence of equi-molar sorbitol retain only 4 to 5% of their seed storage lipid. High concentrations of glucose nearly eliminate breakdown of seed storage lipids. Seedlings were grown on the indicated media for 14 or 22 days prior to collection for fatty acid analysis. The majority of seedlings grown on 0.27 M glucose, 0.3 M glucose or 0.4 M sorbitol + 0.03 M glucose exhibit arrested development. However, some of the seedlings grown on these media escape the selection, as shown by development of relatively normal shoot systems, and were not collected for analysis. Seedlings grown on 0.03 M glucose, 0.24 M sorbitol + 0.03 M glucose or 0.27 M sorbitol + 0.03 M glucose exhibit a nearly uniform morphology, and so all seedlings from these media were collected for analysis. 20:1 fatty acid levels are expressed relative to the amount of 20:1 fatty acid present in seeds prior to the start of imbibition. Note that the amount of 20:1 fatty acid present in ungerminated seeds was obtained from independent experiments. Results presented are means ± SD (n = 3). Glc, glucose; Sorb, sorbitol. This experiment was repeated, with similar results. The effects of high glucose concentrations on lipid breakdown could be due to a non-specific inhibition of developmental and/or metabolic processes. Consistent with this possibility are findings that seedlings arrested by growth on very high concentrations of sorbitol (0.4 M sorbitol + 0.03 M Glc) also retain almost all of their 20:1 (Figure 3). However, although the effects of 0.4 M sorbitol + 0.03 M Glc on lipid mobilization are comparable to the effects of 0.3 M Glc, 0.4 M sorbitol + 0.03 M Glc inhibits lipid accumulation to a significantly greater extent than 0.3 M Glc (Table 1). For example, seedlings grown for 22 days in the presence of 0.3 M Glc accumulate approximately twice as much membrane fatty acid as seedlings grown on 0.4 M sorbitol + 0.03 M Glc. These results suggest that the inhibitory effects of 0.4 M sorbitol + 0.03 M Glc on lipid breakdown are less specific than the effects of 0.3 M Glc. Both 0.3 M Glc and 0.4 M sorbitol + 0.03 M Glc also retard seed germination rates (Figure 4). However, both these media supplements delay seed germination by only 4 to 5 days. In contrast, storage lipid mobilization is retarded for a significantly longer time period. 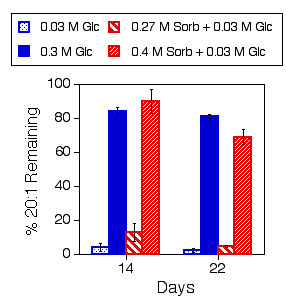 For example, whereas seedlings growing in the absence of added Glc or sorbitol mobilize approximately 50% of their 20:1 within 3 days of the start of imbibition (Figure 1), seedlings grown on 0.3 M Glc or 0.4 M sorb + 0.03 M Glc mobilize only 20 to 30% of their 20:1 after 22 days (Figure 3). Exogenous glucose retards seed germination. Seeds were sown on Arabidopsis minimal media supplemented with the indicated additives. Seed germination, defined as the emergence of any part of the seedling from the seed coat, was scored at regular intervals. Results presented are means ± SD (n = 4). Glc, glucose; Sorb, sorbitol. This experiment was repeated, with similar results. Fatty acid accumulation by seedlings grown on glucose or sorbitol. Previous work indicates that wild-type Arabidopsis seedlings become resistant to the inhibitory effects of high concentrations (0.27 to 0.33 M) of exogenous sugars on seedling development within 2 to 3 days of the start of imbibition . Therefore, it was of interest to determine whether seedlings become resistant to the inhibitory effects of high sugar concentrations on seed storage lipid mobilization within the same time frame. Seeds were either sown on low (0.03 M) glucose media and then transferred after 3 days to high (0.27 M) glucose or sorbitol media, or were sown directly on high glucose or sorbitol media. As shown in Figure 5, seedlings sown directly on 0.27 M glucose exhibit little shoot development after 10 days of growth. In contrast, seedlings grown on 0.03 M glucose for 3 days and then for an additional 7 days on 0.27 M glucose produce very significant shoot systems. In fact, these plants have slightly larger average shoot systems than seedlings grown continuously on 0.03 M glucose (Figure 5). Interestingly, whereas seedlings sown directly on 0.24 M sorbitol + 0.03 M glucose produce larger shoot systems than seedlings sown directly on 0.27 M glucose, seedlings transferred to 0.24 M sorbitol + 0.03 M glucose after 3 days on 0.03 M glucose produce smaller shoot systems than seedlings transferred to 0.27 M glucose (Figure 5). Early exposure to high concentrations of exogenous glucose inhibits seedling development. Seedlings shown in the left column were grown on the indicated media for 10 days. Seedlings shown in the right column were grown on minimal media supplemented with 0.03 M glucose for 3 days, transferred to the indicated media and grown for an additional 7 days prior to photographing. Red bars = 2.0 mm. Glc, glucose; Sorb, sorbitol. 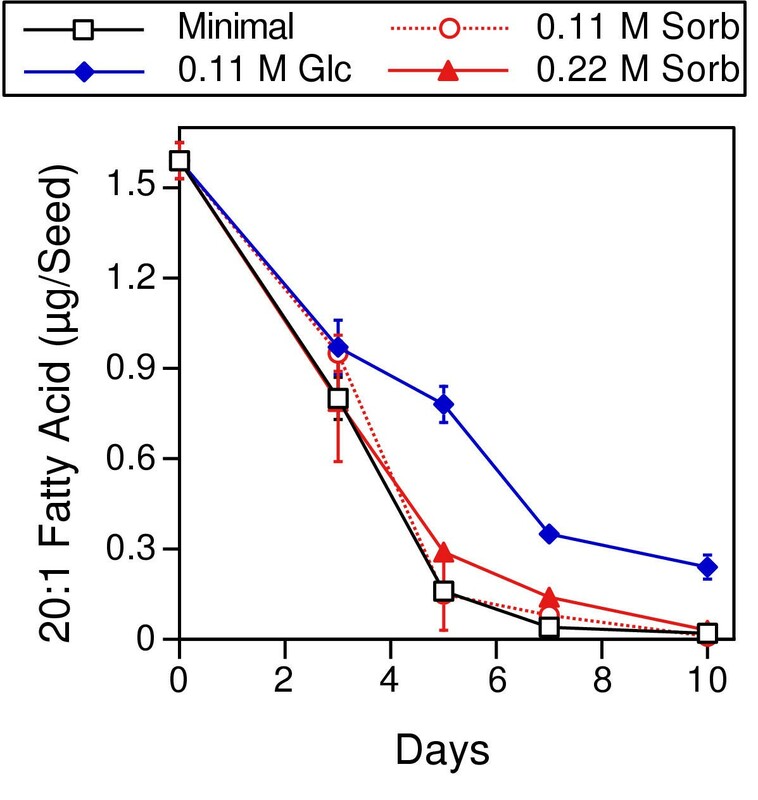 As shown in Figure 6, seedlings sown directly on media containing 0.27 M glucose metabolize only a small percentage of their 20:1 fatty acid after 10 days of growth. In addition, these seedlings exhibit a significant reduction in accumulation of membrane fatty acids. In contrast, seedlings shifted from 0.03 to 0.27 M glucose metabolize almost all of their 20:1 fatty acid within 7 days of the shift, despite the fact that only ~30% of the seed storage lipid is metabolized prior to the shift. In addition, these seedlings actually show increased accumulation of membrane fatty acids relative to seedlings grown continuously on 0.03 M glucose. As an osmotic control, seedlings were grown on 0.24 M sorbitol + 0.03 M glucose for 10 days, or on 0.03 M glucose for 3 days followed by an additional 7 days on 0.24 M sorbitol + 0.03 M glucose. As shown in Figure 6, both the seedlings grown continuously on 0.24 M sorbitol + 0.03 M glucose, or transferred to that media after 3 days on 0.03 M glucose, metabolize almost all of their 20:1 fatty acid. In contrast, seedlings transferred from 0.03 M glucose to 0.24 M sorbitol + 0.03 M glucose exhibit a significant reduction in accumulation of membrane fatty acids, whereas seedlings sown directly on 0.24 M sorbitol + 0.03 M glucose exhibit only a slight reduction. Seedlings become resistant to the inhibitory effects of glucose on breakdown of seed storage lipid and synthesis of membrane lipid within three days of the start of imbibition. Seeds were sown on minimal media supplemented with 0.03 M glucose, 0.27 M glucose or 0.24 M sorbitol + 0.03 M glucose. After 3 days, some of the seedlings grown on 0.03 M glucose were transferred to media supplemented with 0.27 M glucose or 0.24 M sorbitol + 0.03 M glucose. Fatty acid levels were measured in seeds/seedlings harvested after an additional 7 days of growth. Note that this figure depicts the amount of 20:1 fatty acid metabolized by an average seedling, rather than the amount of 20:1 fatty acid remaining in an average seedling. See the "Materials and Methods" section for a description of the method used to estimate accumulation of membrane fatty acids. Results presented are means ± SD (n = 3, except n = 2 for seedlings transferred from 0.03 M glucose to 0.24 M sorbitol + 0.03 M glucose). Glc, glucose; Sorb, sorbitol. This experiment was repeated, with similar results. Several groups of Arabidopsis mutants that are resistant to the inhibitory effects of high concentrations of exogenous glucose or sucrose on early seedling development have been isolated [46–50]. A representative sugar-insensitive (sis) mutant, the sis5-1/abi4-101 mutant, was analyzed to determine whether mutants of this type can also exhibit altered responses to the effects of exogenous glucose on lipid metabolism. 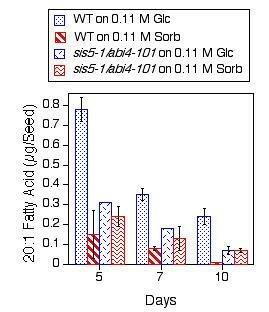 As shown in Figure 7, sis5-1/abi4-101 seedlings metabolize significantly more 20:1 fatty acid than wild-type plants when grown on media containing 0.11 M glucose. In contrast, mutant and wild-type plants metabolize similar amounts of 20:1 fatty acid when grown on 0.11 M sorbitol (Figure 7). Seedlings carrying the sis5-1/abi4-101 mutation are resistant to the inhibitory effects of exogenous glucose on mobilization of seed storage lipids. Eicosenoic (20:1) fatty acid levels were measured in mutant and wild-type seeds/seedlings harvested from the indicated media at different times after the start of imbibition. Results presented are means ± SD (n = 3). This experiment was repeated, with similar results. Although numerous studies have shown that high concentrations of exogenous sugars repress the ability of germinating cereal seeds to mobilize the starch they use as energy reserves [13, 23], little work of a similar nature had previously been conducted on oilseed plants, such as Arabidopsis. Among the few studies done previously is one showing that expression of two genes involved in lipid metabolism is negatively regulated by sugars . In addition, a study of glyoxylate cycle mutants showed a small inhibitory effect of sucrose on total lipid content in germinating seeds . Results presented here indicate that mobilization of seed storage lipid by Arabidopsis thaliana seedlings is significantly retarded in the presence of exogenous glucose. For example, seedlings grown for 5 days on 0.11 M glucose retain approximately five times as much seed storage lipid as seedlings grown in the absence of exogenous glucose. This effect is not due to osmotic stress, as equi-molar, or even twice equi-molar, concentrations of sorbitol have little effect on lipid breakdown. Growth of seedlings on media containing higher (0.3 M) concentrations of glucose results in almost complete elimination of lipid breakdown. For example, seedlings grown in the presence of 0.3 M glucose retain approximately 80% of their seed storage lipid, even after 22 days of growth. The effects of high glucose concentrations on lipid breakdown could be relatively specific or could be due to a non-specific inhibition of developmental and/or metabolic processes. Interestingly, sorbitol can also inhibit seed storage lipid breakdown. However, the effect of sorbitol on seed storage lipid breakdown is only manifested at sorbitol concentrations (e.g. 0.4, M sorbitol + 0.03 M glucose) that also almost completely eliminate seedling growth. In addition, the effects of sorbitol on seedling growth appear less specific than the effects of glucose, as 0.4 M sorbitol + 0.03 M glucose exerts a similar effect on storage lipid breakdown as 0.3 M glucose, but has a significantly greater effect on accumulation of membrane lipids. In addition, although glucose and, to a lesser extent, sorbitol retard seed germination rates, both additives retard mobilization of storage lipids to a significantly greater extent than seed germination. The effects of glucose analogs on lipid breakdown were also determined. Seedlings grown on media containing mannose, but not 3-O-methylglucose, exhibit decreased rates of seed storage lipid breakdown. In many organisms, mannose has been shown to be a substrate for hexokinases whereas 3-O-methylglucose is metabolized poorly, if at all, by hexokinases [62, 65]. As a result, processes that are affected by mannose but not by 3-O-methylglucose have been postulated to be regulated via a hexokinase-mediated pathway(s) [19, 31, 32]. By this logic, the fact that seed storage lipid breakdown is repressed by the presence of mannose but not by 3-O-methylglucose could also be interpreted to mean that inhibition of seed storage lipid breakdown occurs via a hexokinase-mediated pathway. However, alternative explanations cannot be ruled out at this time. First, the extent to which mannose and 3-O-methylglucose are metabolized by hexokinases and other enzymes has yet to be determined for Arabidopsis. In addition, a recent report indicates that mannose may affect some processes by sequestering phosphate, rather than by stimulating a hexokinase-mediated sugar-response pathway . Although the mechanism by which mannose acts is uncertain at this time, the fact that it retards lipid breakdown when present at concentrations of only 1.4 mM indicates that the effects of mannose cannot be attributed to osmotic stress. 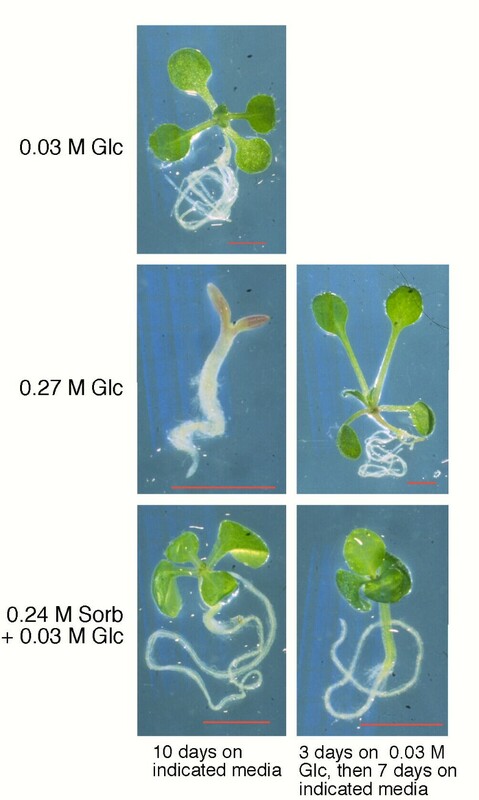 A number of Arabidopsis sugar-response mutants have been isolated that, unlike wild-type plants, are able to develop substantial shoot systems in the presence of 0.27 to 0.33 M sucrose or glucose [46–50]. Analysis of a representative mutant of this type, the sis5-1/abi4-101 mutant , reveals that it is resistant to the inhibitory effects of exogenous glucose on seed storage lipid breakdown. This result indicates that mutations that alleviate the negative effects of exogenous sugars on early seedling development can also reduce glucose-mediated inhibition of seed storage lipid breakdown. 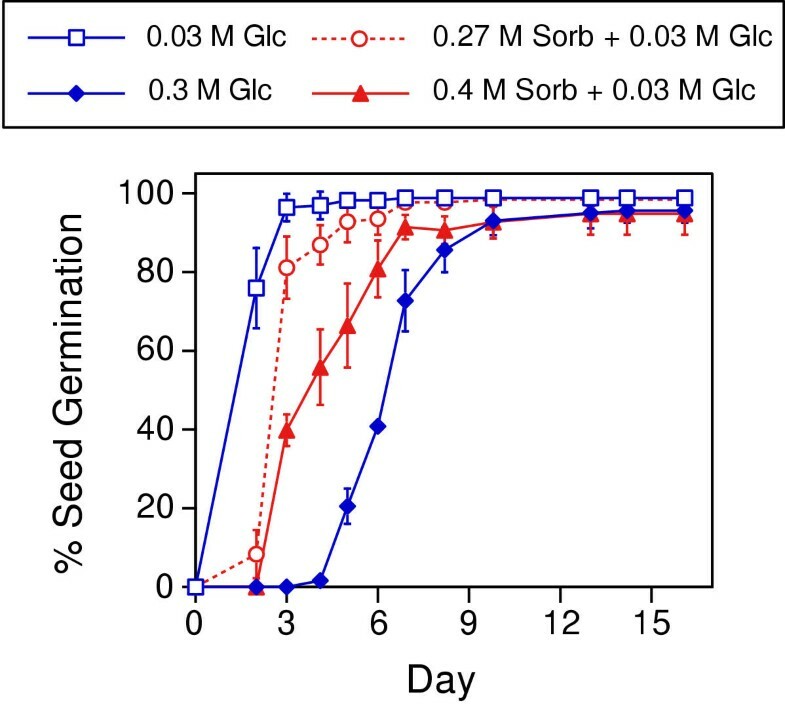 Media-shift experiments indicate that wild-type seedlings become insensitive to the inhibitory effects of exogenous glucose on seed storage lipid metabolism within 3 days of the start of imbibition. Interestingly, wild-type Arabidopsis seedlings were shown previously to become insensitive to sugar-mediated inhibition of early seedling development within 2 to 3 days of the start of imbibition . In addition, seedlings of Brassica napus, a close relative of Arabidopsis, undergo a dramatic metabolic shift during the same time period . Approximately 2 days after the start of imbibition, B. napus seedlings shift from being dependent on lipid breakdown to being dependent on photosynthesis for sugar formation. The similar timing with which these events occur suggests that completion of the metabolic transition from lipid breakdown to photosynthesis as the primary source of sugars results in loss of sensitivity to the negative effects of sugars on lipid breakdown and early seedling development. However, exogenous sugars can completely compensate for mutations that disrupt the glyoxylate cycle . This finding suggests that the negative effects of high concentrations of exogenous sugars on early seedling development and seed storage lipid breakdown are not the result of sugar-mediated inhibition of the glyoxylate cycle. Further experiments will be required to clarify the relationship between inhibition of early seedling development and seed storage lipid breakdown by exogenous sugars. Although many studies have examined the effects of sugar levels on rate of starch breakdown by germinating cereal seeds, little effort has been devoted to characterizing the effects of sugar levels on lipid breakdown by germinating oilseed plants. Work presented here demonstrates that growth in the presence of exogenous glucose significantly retards mobilization of seed storage lipid in germinating seeds from wild-type Arabidopsis. In contrast, the sugar-insensitive mutant sis5-1/abi4-101 is resistant to the inhibitory effects of exogenous glucose on lipid breakdown. The effect of glucose on seed storage lipid breakdown is not solely due to the osmotic potential of the media, as substantially higher concentrations of sorbitol than of glucose are required to exert significant effects on lipid breakdown. Mannose, but not 3-O-methylglucose, also inhibits lipid breakdown. This result suggests that phosphorylation by hexokinase may be required for inhibition of lipid breakdown. However, as metabolism of these glucose analogs remains to be characterized in Arabidopsis, alternative explanations cannot be ruled out at this time. The inhibitory effects of glucose on lipid breakdown are limited to a narrow developmental window. Within approximately three days of the start of imbibition, germinating Arabidopsis seeds become insensitive to the inhibitory effects of exogenous glucose on seed storage lipid mobilization. This result suggests that completion of some critical metabolic transition results in loss of sensitivity to the inhibitory effects of glucose on lipid breakdown. Seeds of wild-type Arabidopsis thaliana var. Columbia were originally obtained from Dr. Chris Somerville (Carnegie Institution of Washington, Palo Alto, CA, USA). Isolation of the sis5-1/abi4-101 mutant of Arabidopsis thaliana var. Columbia has been described previously . Seeds/seedlings to be used in fatty acid assays were grown on sterilized 3 MW Gel Blot Paper (Midwest Scientific, Valley Park, MO, USA) placed on Petri plates containing solid Arabidopsis minimal media , supplemented with the indicated additives. The gel blot paper prevented growth of the roots into the media, allowing for easy and quantitative removal of seedling tissue for analysis. Unless otherwise noted, plants were grown under 60 to 80 μmol photons m-2 s-1 continuous fluorescent light, at a temperature of 21 to 25°C. Lipids were extracted and fatty acids derivatized to form the corresponding methyl esters using an established procedure . Typically, 25 to 50 seeds/seedlings were collected from a sector of a Petri plate for each assay. The seeds/seedlings were incubated in 0.6 to 2.0 ml 1 N methanolic-HCl (Supelco, Bellefonte, PA, USA) at 80 to 83°C for 1 to 2 h. Equal volumes of 0.9% (w/v) NaCl and hexane were added to each sample. The samples were shaken by hand for 1 to 2 min and then spun at 2,000 g for 5 min at room temperature. The top (hexane) layers of each sample were transferred to vials and stored at -20°C prior to being analyzed by gas chromatography. Fatty acid methyl ester levels were measured by gas chromatography using a previously described program . Two μl aliquots of each fatty acid methyl ester extract were injected onto a 5890 Series II gas chromatograph from Hewlett Packard containing a 30 m SP2330 column with an inner diameter of 0.75 mm (Supelco, Bellefonte, PA, USA). The column was exposed to the following temperature program: 100°C for 1 min, ramp to 160°C at 25°C per min, ramp to 220°C at 10°C per min, 220°C for 4.6 min. The pressure program for the column was: 30 kPa for 9 min, ramp to 70 kPa at 40 kPa per min, 70 kPa for 7 min. The temperatures of the injector and the flame ionization detector were 220°C and 250°C, respectively. Helium was used as the carrier gas. Gas chromatograph peaks were identified by comparing their column retention times with the retention times of fatty acid methyl ester standards (Sigma, St. Louis, MO, USA). The quantities of all major fatty acids in each sample were determined by comparing the sizes of the gas chromatography peaks produced by each sample with the sizes of the peaks produced by fatty acid methyl ester standards of known concentration. This data was used to calculate the net amounts of membrane fatty acids produced by the seedlings in each sample. In oilseeds such as Arabidopsis, the bulk of the fatty acids present in seeds and very young seedlings are found in storage lipids. For example, storage lipids comprise 93% of the total lipid found in ungerminated seeds of Brassica napus, a plant species that is closely related to Arabidopsis. The remaining 7% of seed lipids consist of non-storage lipids, such as membrane lipids. To calculate the increase in the amount of membrane fatty acid in a particular group of seedlings, it is necessary to subtract the amount of seed fatty acid (both storage and non-storage) remaining in those seedlings from the total amount of fatty acid present in the seedlings. As approximately 93% of seed lipids consist of storage lipids , the total amount of fatty acid found in ungerminated seeds is multiplied by 0.93 to determine the amount of fatty acid present in the storage lipid of ungerminated seeds. This number is then multiplied by the fraction of 20:1 (eicosenoic) fatty acid remaining at day "x", to account for the percentage of storage lipid that has been metabolized by day "x". Assuming that different seed-storage fatty acids are metabolized at similar rates, eicosenoic fatty acid levels will reflect seed storage lipid levels as eicosenoic fatty acid is present in significant amounts in seed storage lipids but is almost entirely lacking from non-storage lipids, such as membrane lipids . As approximately 7% of seed lipids consist of non-storage lipids , the total amount of fatty acid found in ungerminated seeds is multiplied by 0.07 to determine the amount of fatty acid present in the non-storage lipid of ungerminated seeds. Seeds were surface sterilized and sown on the indicated media. Seeds were scored for germination at regular intervals. Seed germination is defined as the emergence of any part of the seedling from the seed coat. For media-shift experiments, 3 MW Gel Blot Paper was placed on top of solid media in Petri plates. Nytex mesh 3-300/46 screens (Tetko Incorp., Kansas City, MO, USA) were then placed on top of the blot paper and seeds sown on top of the nytex screens. At the indicated times, the nytex screens and seeds/seedlings were transferred to fresh Petri plates containing 3 MW Gel Blot Paper on solid media. During the publication of this work, a manuscript by Martin et al. that also describes research on the effects of exogenous sugars on storage lipid mobilisation appeared in Plant Physiology 128: 472-481. This work was supported by the U.S. Department of Energy, Energy Biosciences Program Grants DE-FG03-00ER15061 (S.I.G.) and DE-FG02-95ER20203 (W.-D.R.). J.P.C.T. conducted many of the fatty acid analyses, including growing and harvesting plants, preparing fatty acid methyl esters and analyzing some of those fatty acid methyl esters on a gas chromatograph. W.-D.R. did much of the gas chromatography work. S.I.G. conceived the study, did the remaining fatty acid analyses, analyzed the resulting data and prepared the manuscript.